Fairway villa located on Sea Trail Maples Golf Course - HIGH SPEED WIRELESS INTERNET- 5 LARGE SCREEN 55" TELEVISIONS WITH SOUNDBARS No Phone - Non-smoking. 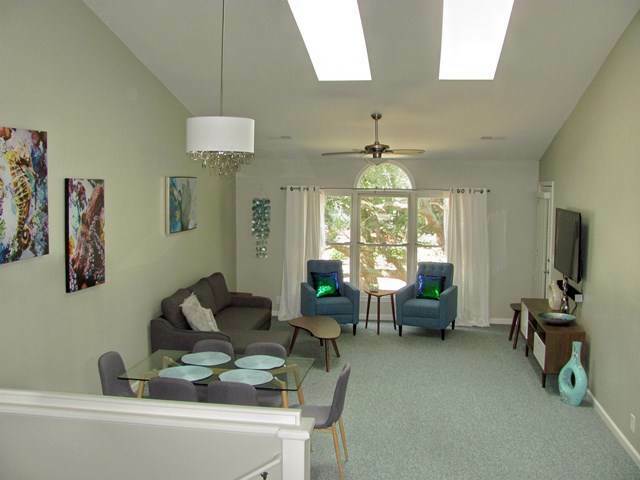 Three bedrooms/three full baths , two kitchen areas, 4 queen beds, 1 king bed, 2 sleeper sofa beds (fold out to king size - 2 flat sheets needed) 5 large screen 55" flat panel smart televisions with Roku and soundbars, central heat & air, two laundry areas with washer/ dryers. The lower level features an open two bedroom floor plan with adjoining kitchen, dining and living areas. The lower level back bedroom has 2 queen beds, a private bath and screened porch area. The lower level front bedroom has one king bed,,a kitchenette area wtih microwave & coffee maker and private bath. The upper level 1 bedroom suite has a large open living/kitchen/dining area with vaulted ceilings and skylights. The upper level master bedroom has two queen beds a private bath and screened porch. Both upper and lower kitchen areas are fully-equipped with dishwasher, microwave, coffee maker, blender, toaster, full-size refrigerator and range. The sofas will fold out for use as sleeper sofas if needed (2 King flat sheets required for use). Complimentary linens, towels and departure cleaning service are included with rental.